It’s June, and for those of us checking in from the northern hemisphere, that means we’ve made it to summer. Summer brings a whole new bag of extremes to the table – from oppressive heat to tropical downpours. So then, who ended up being the hottest of the hot, the coolest of the cool, the wettest of the wet, and did it even manage to snow? Let’s find out. 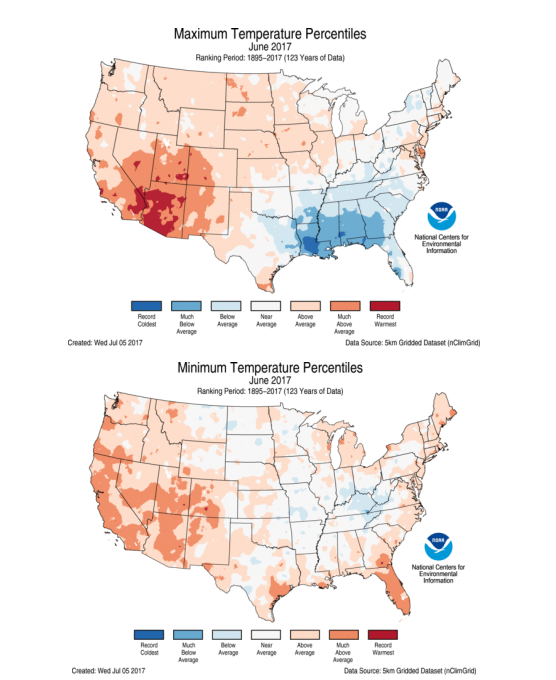 Unlike May, where heat and cold traded places every week, the June pattern was much less willing to change. So where it was hot, it stayed hot. The bulk of the heat, and oppressive heat at that, ended up in the southwestern US where triple digit afternoon highs were as plenty as triple digit air conditioner bills. 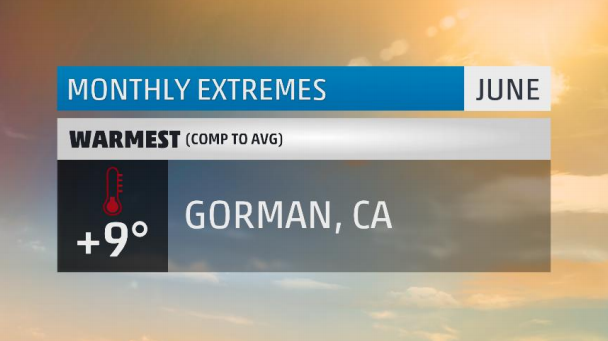 The hottest of the bunch was Gorman, CA – a town smack-dab in the middle of Los Angeles and Bakersfield just off The 5 – where they ended the month 9 degrees above average. Being somewhat sheltered in a valley makes Gorman’s climate a bit more temperate. Average highs throughout June are in the 70s – pretty nice, right? This June was much different. Temperatures were above average for 25 of the month’s 30 days and included fifteen 90-degree days! Amongst the heat was a 12-day heatwave where the temperature hit 101 degrees on two separate occasions. All of this was enough to be the 3rd warmest June on record in Gorman. Speaking of June records, the top three warmest Junes have all occurred in the past three years (#1 – 2016, #2 – 2015). It’s also Gorman’s 5th warmest year-to-date (meaning January 1st through June 30th). And go figure, the top five warmest year-to-dates have also occurred in the past five years (#1 – 2015, #2 – 2014, #3 – 2016, #4 – 2013). I have a feeling when the new set of 30 year averages come out in a few years; Gorman’s temps are all looking up. Elsewhere, other than a sprinkling of warm June temps here and there, troughy, rainy, and generally cloudy weather kept things rather chilly. In particular, a stretch of rather ugly weather kept places from the Gulf coast through the Piedmont begging for the sun’s warmth. Two noteworthy early-season 100 degree readings popped up in the northeast this June. Both Shippensburg in Pennsylvania and LaGuardia airport in New York managed to squeak out a triple digit afternoon. Phoenix, on the other hand, had 27 days where the mercury topped 100 degrees. Typically, they see 24 such days in June…so I guess they’re used to it by now. In that zone of wet, cloudy, raw, ugly weather, temperatures stayed quite on the cool side. 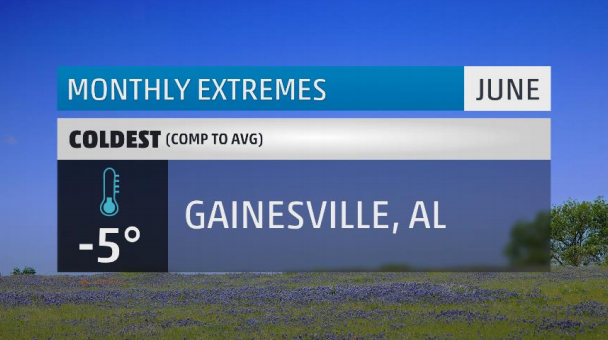 The chilliest such location was Gainesville, Alabama where June 2017 was their coldest on record at five degrees below the average. The cold snap can be directly attributed to 18 days of rain in the month which dropped close to a foot of rain in the town. That’s eight whole inches above average! All that rain made for their wettest June on record. Twenty-six days ended up below average with six of those being at least 10 degrees below average. With rainfall being the primary control knob, the biggest changes in temperature occur with the afternoon highs. Wet ground heats inefficiently. The majority of the energy transferred to wet ground goes into evaporation. Evaporation also has a net cooling effect (Google “latent heat” and have yourself a fun self-guided thermodynamics lesson). Because of this, afternoon highs will fail to reach their potential in places with wet ground. The opposite is true at night. Wet ground does not radiate heat back into space as well as dry ground does. Instead, the ground will hold onto whatever heat it has and the result is a warm, and usually muggy, overnight low. So while the lows in this region were quite warm, the highs were just that much cooler and led to the large swath of below average temperatures. This concludes our impromptu meteorology 101 lecture. This will be on the test. Remember when I said that June can often bring tropical weather into the picture? Well, it was already going to be a wet month across the south as a direct flow out of the Gulf of Mexico and any number of stalled frontal boundaries led to day after day of widespread soaking thunderstorms. Then Tropical Storm Cindy showed up. 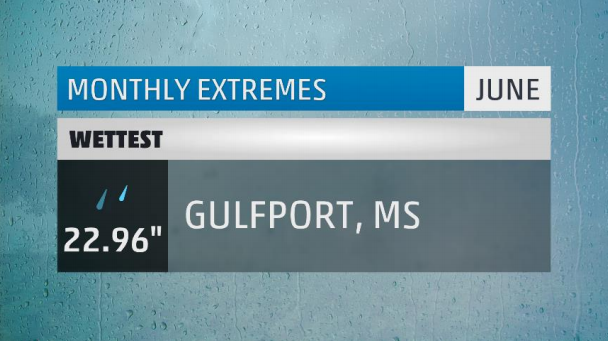 In Gulfport, Mississippi, it was their wettest June on record by more than five inches! Close to two feet of rain was enough to be 16 inches above the monthly rainfall average. Twenty-two days had measurable rainfall while the longest dry stretch was a paltry three days. Thanks to Cindy, Gulfport picked up an additional 11 inches of rain that week. It was enough to make for the 3rd wettest calendar month on record, only being beat by two other months which each had two direct tropical impacts (September 1998 – Georges and Hermine, and July 1945 – Hurricane One and Tropical Storm Two). “Thanks a lot, Cindy,” said no one living in Gulfport. 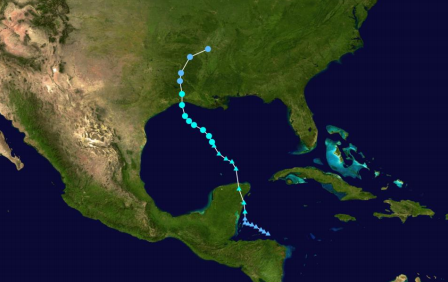 Tropical Storm Cindy formed on June 20th and was the first storm to make landfall in Louisiana since Isaac in 2012. Cindy was a relatively weak storm wind-wise, but had a very large and robust precipitation shield which spread heavy rainfall from Texas to New England. Cindy’s path can almost be traced through the green dots of cities where that had a top 10 wettest June on record. 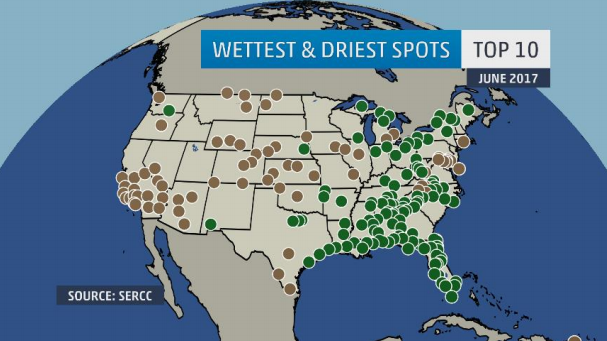 One particularly happy green-dot-covered state is Florida which had been dealing with drought and widespread wildfires for months. A June soaking was just what the doctor ordered. They did it again! 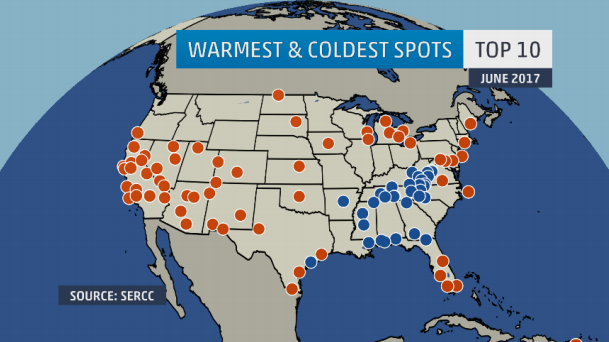 For the third month in a row, the sunniest place in the United States was Barstow, California. This month, however, they said to heck with the clouds, we don’t need no stinkin’ clouds! And it was so. Each day of the month had an average sky cover of zero percent. That’s a whole lot of blue skies and starry nights. It was also stinkin’ hot. 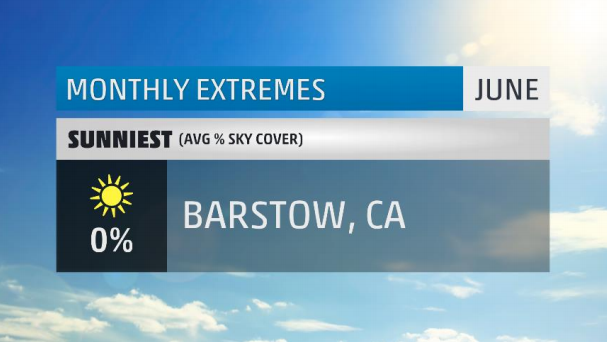 Barstow managed 16 straight 100-degree days in June. Phew! There were plenty of gray skies over Magic Kingdom this June. All 30 days of the month were at least partly cloudy or worse in Orlando. Twenty-one days featured measurable rainfall, yet somehow they still managed to end the month in a rainfall deficit. The cloud cover was thanks to a rather stale atmospheric pattern. Warm, soupy air with not much changeability led to day after day of samesy weather. In Orlando’s case, that meant clouds and occasional thunderstorms. Over average, April through August tend to be Orlando’s sunniest months of the year. They just happened to not get the memo in 2017. 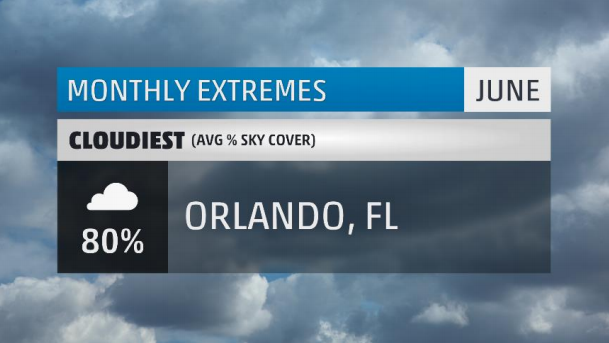 On the bright side, Orlando average just over 200 sunny days per year which puts it over the US average. Maybe July will be a little more cheery. 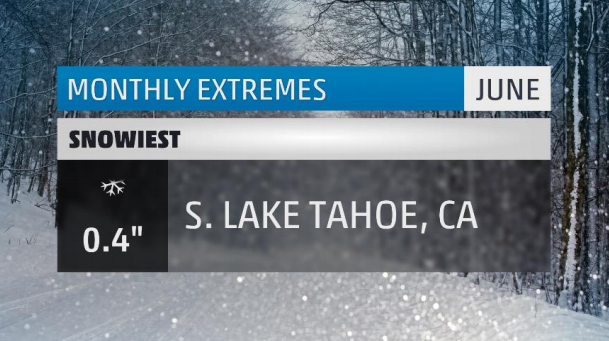 There you have it, the extremes for the month that was June 2017. Make sure to check back next month to see what July has in store. What weather extremes did you face in June? Let me know in the comments below. “Cindy dropped heavy rain from Texas to New England.” Well, then, How come the track stopped in Tennessee? Sure they did. Sarcasm lives everywhere. Sunshine state not very sunny!